Wear Gray For a Day is an event in SL in it’s 3rd year, started by Sanura Snowpaw, to raise funds and awareness for brain tumors. Designers from all over the grid have come together, with items to purchase for your donation, you can read more about it at Wear Gray’s official blog. Weather! or not, a store of much funness, helps set the mood with their donation items at Wear Gray. !WorN? has a Jester Chair in gray tones, and in the gacha machine, exclusively for the event, Jester Hats in five different colors! Both are mesh, and oh so fun! The Chair comes witih 9 animated sits, all much fun for photoing or sitting and such. Hurry over and get yours now, show brain tumors just what we think of them! Atomic is a favorite shop, and I always delight when they release the Grace skin in special editions. Unfortunately, the one I’m wearing isn’t available anymore, but there is good news! There is a new version of Grace at The Dressing Room Blue now, Grace – Spring in Buff, and you should hurry on over and get it, it’s only there for another week or so. I love it too and I”m sure it’ll be seen in future blog posts. Balance is an important element of life, a struggle we all must go thru in all aspects of life. At Chic Management’s Back to Black event, you’ll find all kinds of inspirational, supportive and informative goodies just waiting to help you get your balance. Back to Black is well underway and if you haven’t yet been, now is a good time. The lag has been manageable and there is much much great stuff so you’ll want to be sure to have some time to look it all over. No doubt you’ll also get sidetracked reading some of the info provided about various mental health issues, so plan lots of time. It’s so fun to see what the different designers have done to reflect their interpretation, experiences and/or interests regarding such an important topic for all of us. 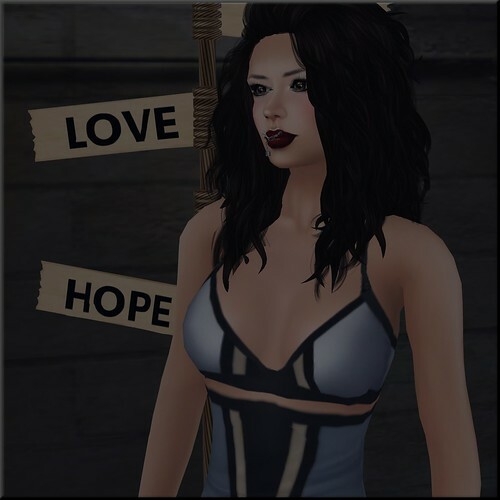 I’ve had fun playing with the different props, accessories and clothing from Back to Black, and here are just a few of my fave pics (There’s a few more back on Flickr). The lovely Sn@tch blouse that will go with so many things, the delicious Lassitude & Ennui boots (I’m hoping for a matching corset, complete with detailed lace up), the yoga studio (Flickr) from Elefantu, the well executed poses from Geez, and so much more. Back to more shopping and more photoing for me, see you there! A few days back, Apple May of Apple May Designs released a new skin for her line called Sophie. It had been a long while since I’d tried Apple’s skins, and I was delighted to find Sophie not only fit my AV well, but is a temptation of delectability and deliciousness. Sophie comes in 7 tempting tones, each with 4 make ups in the Eccentric line. I love them all, but my fave of the moment is the Peachy tone with Eccentric 2. I’m so slow at getting things blogged, one of my New Year’s resolutions is to work on that, with a little help from my Partner In Crime, the Jentastic. A few of my favorite recent finds are the Atomic Skinny Jeans which I’ve added to my folder of Top 10 Jeans, and the Atonement Top from Kyoot that I found at a past Collabor88, but it’s still available in the main store if you didn’t get it yet, I’m sure you’ll love it and its textures as much as I do. Lastly, but far from leastly, Truth Hawks has tempted me to buy new hair again! I just can’t keep up with that Evil Wizard of Hairyness! Andrea was released a couple of weeks ago, and I need last weeks release yet, and soon it’ll be time for this weeks release, which no doubt I’ll need too!! Well, enough of my babble, I must plan more pics and posts and we all most go shop and give in to tempations!!! January where I live RL, we are usually knee deep in snow and frozen in frigid temps, but not this year, not til I ventured over to Happy Mood in Winter for some virtual snow. The very next day, our temps dropped and we woke to a blanket of snow. I was glad I had, for my virtual visit, a hot new skin and some great new group gifts to wear. Sachi Vixen over at Adam n Eve has been churning out some gorgeous and hot skins lately, and her latest hotness, Natalie, is my fave so far. Natalie is available in 4 delectable skin tones, all so well tinted and highlighted, I just love them all, but I’m wearing Natural here as I generally prefer lighter tones. They are available in 12 make up options, every one more luscious then the last. I’m wearing Bare here, as I was feeling a bit casual for my chilly outing. If you haven’t been to Adam n Eve lately, you need to get on over there, and I have heard rumor of even more hotness coming in the near future! Go Sachi Go! I love the newest group gift from Sleepy Eddy, the detail is just perfect, I love the brown and I want this in RL too. It’s a men’s sweater, but who doesn’t love a cozy man sweater on a chilly day? Insufferable Dastard also sent out a group gift, eyes in three lovely shades of brown, my favorite being the Medium Brown. Another group goody is from Kooky, she’s switching her subscriber system to a new one, and by signing up on the new, you’re thanked with a set of cozy boots, in his and her sizes, I chose the brown, tho they come in other colors too. Now you’ve got lots to do if you wanting your SL turned up a few degrees. Start with a new Natalie skins, grab some group love and have a great Friday the 13th!!! I was given the opportunity to blog the newest skin from Skin Within, created for the Rezzable event happening now. and I have been delightfully blue ever since. Ayesha Bisiani of !Skin Within is known for her detailed and refined make up looks and she has outdone herself with her two newest creations. The Droe Exotica skin is so delicate you really need to go try the demo for yourself to see. Make sure you check it ALL out…there are some lovely bits not shown here. I love not only the detail but the uniqueness of this skin, with so many Avatarwanabe skins in the grid lately…this is a very refreshing change of originality. The second skin created for the Rezzable event, A.N.A. Cyborg, is a delight of floral fantasy. It’s lovely detail is again something you need to see to appreciate. Run on over quickly and get your demos…I know you’ll love these works of art and enjoy wearing them as much as I have.